Well, the uproar from the design community regarding Apple's redesigned logo for the new version of iTunes has inspired me to do one of my own. Also, Wired Magazine was running a photoshop contest on their Gadget Lab Blog and I could use a new iPod Shuffle. I've seen the outpour of self proclaimed designers take their stab at their own iTunes 10 logo, and most are mediocre at best. Why? It's because most designers don't or can't produce the level of sophistication that Apple does. Apple creates things at a high level of reality and detail which requires more time than the average designer will put into a project. Now, I wasn't going to spend more than an hour on this, so I'll call out myself on being hypocritical, but wanted to throw my hat in the ring to see if I had what it took to be an Apple icon designer or at least have this hold up against the icons in the family. And for the record, I happen to like the icon and don't see why players gotta hate (here's a Forbes article to back me up). I take issue with the typographical treatments on the website more than anything, but that's another convo. I first started with what I thought iTunes was in the first place, and therein lied the challenge: iTunes no longer exclusively represents music (and hasn't for quite some time). With music, movies, tv shows, books, podcasts, radio, and of course apps, even the iTunes name doesn't make much sense anymore, let alone the icon with an eighth note over a CD (see below). 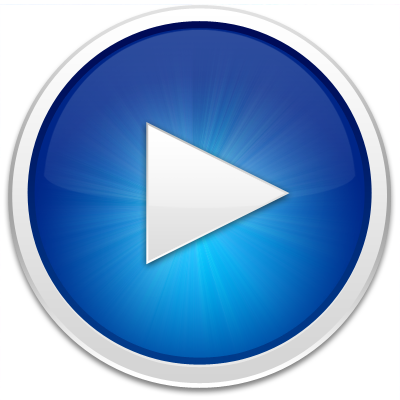 My attempt was to focus on iTunes' and media consumption in general's most basic function, the play button. I used Apple's signature OSX Aqua Human Interface Guidelines, the photo-illustrative style, as the foundation for the design by incorporating bevels, gradients, reflectivity, translucency, and bright color. Added a beveled play button, a burst effect in the center for some pop, a slight drop shadown, and viola! Hey, it's no cyberduck icon that's for sure, but I like it, maybe I'll hack into my system and use it who knows. And some may still scoff at the practice of the gloss, glass, and gradients of the Aqua style, but you must admit, it's worked just fine for Apple. Very well written information. It will be precious to each one who uses it, as well as myself. Thanks a lot! iTunes no longer exclusively represents music.I understood somethings through reading your post.It is really amazing.I will see here to know more about iTunes. Client encounter is similarly as imperative as your application or programming itself as purchasers today request comfort and ongoing correspondence alongside quality. This is the place programmable SMS comes in to execute ongoing correspondence with clients for security validation and warnings also.